The global biopesticide market is anticipated to grow during the forecast period. According to a report by Transparency Market Research, the global biopesticide market is fragmented in nature due to entrance of several new players at local scale in the market. The entrance of new players are a threat to the existing players and it might increase competition in the market. Players are therefore, focusing on innovating new products to stay ahead in the market. The top players in the market are cementing their position by promotional channels and robust sales in various countries. The leading players engaged in the global biopesticide market are BayerCropScience, Du Pont, Syngenta Wayne Agro, Certis USA L.L.C., FMC Corporation, LageyCia. S.A., CBC (Europe) Srl, Biogard, Nufarm Agricultural Products, Lallemand Inc, Emery Oleochemicals, Agrichem, S.A., BioWorks, Inc., International Penaacea, Kan Biosys, AgriLife, Stockton Group, Monsanta, and Biogrow. The global biopesticide market is anticipated to grow at a staggering CAGR of 13.9% during the forecast period of 2017 to 2025. The market was worth US$3.3 bn during 2017 and is expected to rise up to the valuation of US$9.5 bn by the end of forecast period. The global biopesticide market by product segmented is led by bioherbicides as it contributed major share in the market during 2015 to 2016. It is expected to lead the market in the coming years. The biopesticide market in North America is leading the market compared to all other regions. This region accounted for US$1,300.25 mn during 2017 and is expected to reach US$3,667.49 mn by the end of 2025. The market in North America is anticipate to rise a significant CAGR of 13.8% by the end of 2025. The global biopesticide market is anticipated to rise in the coming years due to high demand for ecofriendly agricultural treatment products. Government of various regions are implementing rules to adopt ecofriendly products for agriculture. Government agencies are also engaging in promotional activities to promote the same. The rise in trend for organic food is also leading to the rise of global biopesticide market. The rise in awareness among urban consumers regarding the ill effects of chemically grown raw foods is one of the major factors for the rise in demand of the market. Consumers are willing to shell out extra for organically produced products. The rise in growth of bio-control seed treatment solutions is fueling the market for biopesticide. Rising cost of chemical pesticides and fertilizers are also boosting the adoption of biopesticides in the market. The shift to sustainable methods to improve the crop yield in various parts of the world is leading to rise of global biopesticide market. The rise in population has led to rise in food demand across the globe thus, driving the market for biopesticides. Preference of eco friendly pest management method over the conventional method is also another factor for the rise in demand. Biopesticide offers a variety of services such as increased efficacy of action, sustainable protection of crops, and targeted activity on pest population. Therefore, adoption of biopesticide for crop protecting is increasing in demand so as to discourage chemical pesticides that harm ecology and human health. 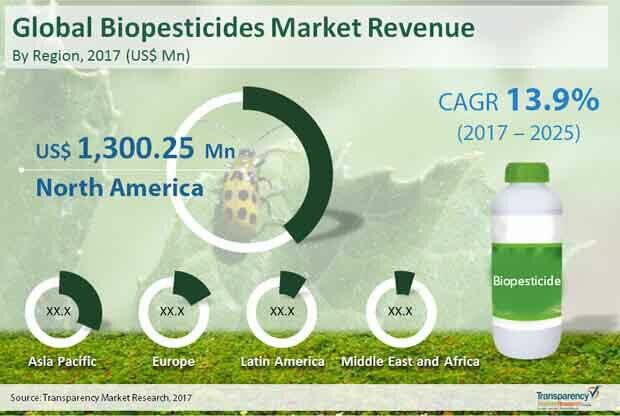 The global biopesticide market is expected to suffer restrains in the market during the forecast period which might hamper the growth of the market. Lack of awareness among developing economies are likely to be one of the major reasons for the downfall of the market. Developing or underdeveloped economies are lacking infrastructure development thus, leading to sluggish growth of the market. The comeback of pests due to indiscriminate usage of synthetic chemical pesticides is another factor that can affect the growth of market in the coming years. Emerging economies fail to endorse in research and development activities due to economical crunches which could highly affect the growth of biopesticide market in this region.